We love the series of jewellery making booklets produced by Leisure Arts. They may be just 32 pages but each one has plenty of project ideas that are both accessible and wearable. 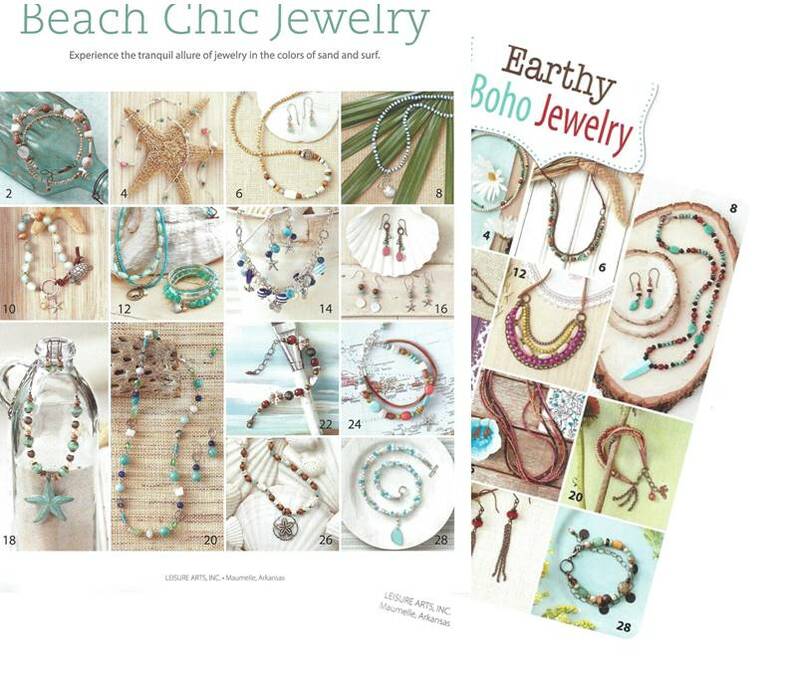 Beach Chic Jewelry and Earthy Boho Jewelry are the perfect additions to your beading library at this time of year. With summer (hopefully!) 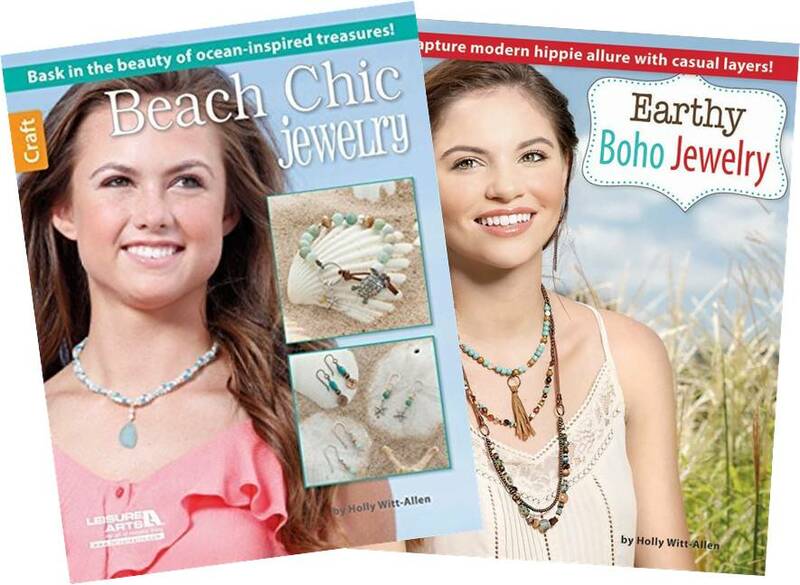 hotting up and many of us planning beach holidays and festival fun, these two books from Holly Witt-Allen are sure to get you making the ideal accessories to your outfits. Each book has a quick and easy reference at the beginning with a photograph of each project and a page number. I love that all the pieces together form a cohesive collection of jewellery with beautiful colour palettes and a distinct style that permeates through all the designs. All the pieces in both books can be made with simple stringing, linking and knotting techniques and all the skills you will need are covered in the General Instructions sections at the back of each booklet. This means that both are the perfect choice for beginners or those makers who just struggle for ideas on materials or colour combinations. You can choose to follow the instructions to the letter and use the same supplies as the designer. There is a list of those supplying beads for the designs right at the back of the book and I am sure you could locate the exact same components if you wanted. 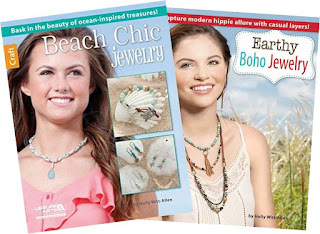 However, the great thing about the designs in these books is that you can easily adapt them to work with beads and materials you already have in your stash. Here are two gorgeous bracelets I made using materials I already had to hand, inspired by the 'Splash of Color Bracelet' and 'Relics Bracelet'. The instructions were really easy to follow and I just picked out beads in similar colours and took inspiration from the relaxed style. I would definitely recommend these two booklets to newcomers to jewellery making and also for those looking for colour ideas and ways to make more layered and textural pieces. They would make a great and inexpensive addition to your bookshelf. Random.org has picked a winner of our Country Garden Earrings Creative Pack from Spellbound Bead Co.
V Reeve - please email us at helen@thebeadinglibrary.com and we'll arrange for your prize to be sent. Look out for our latest giveaway over on our Facebook page!